Significant in-plant control of both waste quantity and quality is possible for most subcategories of the phosphate manufacturing industry. 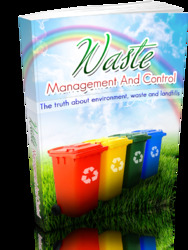 Important control measures include stringent inprocess abatement, good housekeeping practices, containment provisions, and segregation practices . In the phosphorus chemicals industry (subcategories A, B, and C in Table 3), plant effluent can be segregated into noncontact cooling water, process water, and auxiliary streams comprising ion-exchange regenerants, cooling tower blowdowns, boiler blowdowns, leaks, and washings. Many plants have accomplished the desired segregation of these streams, often by a painstaking rerouting of the sewer lines. The use of once-through scrubber waste should be discouraged; however, there are plants that recycle the scrubber water from a sump, thus satisfying the scrubber water flow rate demands on the basis of mass transfer considerations while retaining control of water usage. The containment of phossy water from phosphorus transfer and storage operations is an important control measure in the phosphorus-consuming sub-category B. Although displaced phossy water is normally shipped back to the phosphorus-producing facility, the usual practice in phosphorus storage tanks is to maintain a water blanket over the phosphorus for safety reasons. 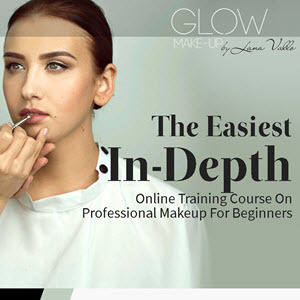 This practice is undesirable because the addition of makeup water often results in the discharge of phossy water, unless an auxiliary tank collects phossy water overflows from the storage tanks, thus ensuring zero discharge. A closed-loop system is then possible if the phossy water from the auxiliary tank is reused as makeup for the main phosphorus tank. Another special problem in phosphorus-consuming subcategory B is the inadvertent spills of elemental phosphorus into the plant sewer pipes. Provision should be made for collecting, segregating, and bypassing such spills, and a recommended control measure is the installation of a trap of sufficient volume just downstream of reaction vessels. In the phosphates subcategory C, an important area of concern is the pickup by stormwater of dust originating from the handling, storing, conveying, sizing, packaging, and shipping of finely divided solid products. Airborne dust can be minimized through air pollution abatement practices, and stormwater pickup could be further controlled through strict dust cleanup programs. In the defluorinated phosphate rock (D) and defluorinated phosphoric acid (F) subcategories, water used in scrubbing contaminants from gaseous effluent streams constitutes a significant part of the process water requirements. In both subcategories, process conditions do permit the use of contaminated water for this service. Some special precautions are essential at a plant producing sodium phosphates (F), where all meta-, tetra-, pyro-, and polyphosphate wastewater in spills should be diverted to the reuse pond. These phosphates do not precipitate satisfactorily in the lime treatment process and interfere with the removal of fluoride and suspended solids. Because unlined ponds are the most common treatment facility in the phosphate manufacturing industry, the prevention of pond failure is vitally important. Failures of these ponds sometimes occur because they are unlined and may be improperly designed for containment in times of heavy rainfall. Design criteria for ponds and dikes should be based on anticipated maximum rainfall and drainage requirements. Failure to put in toe drainage in dikes is a major problem, and massive contamination from dike failure is a major concern for industries utilizing ponds. 1. In ammonium phosphate production and mixed and blend fertilizer manufacturing, one possibility is the integration of an ammonia process condensate steam stripping column into the condensate-boiler feedwater systems of an ammonia plant, with or without further stripper bottoms treatment depending on the boiler quality makeup needed. 2. Contaminated wastewater collection systems designed so that common contaminant streams can be segregated and treated in minor quantities for improved efficiencies and reduced treatment costs. 3. In ammonium phosphate and mixed and blend fertilizer (G) production, another possibility is to design for a lower-pressure steam level (i.e., 42-62 atm) in the ammonia plant to make process condensate recovery easier and less costly. 4. When possible, the installation of air-cooled vapor condensers and heat exchangers would minimize cooling water circulation and subsequent blowdown. 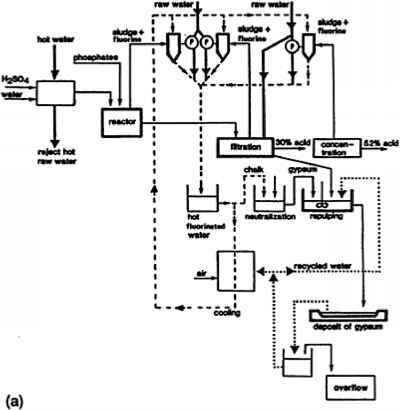 Figure 9 (a) The old process flow diagram and (b) the new process modification for steam segregation and recycle in phosphoric acid production (from Ref. 25). fluorine, and that it makes the treatment of effluents easier and in some cases allows specific recycling. Finally, the new process produced a small reduction in water consumption, either by recycle or discharging a small volume of polluted process water downstream, and required no particular equipment and very few alterations in the mainstream lines of the old process.